The following article was written by David Robinson for the Autumn 2003 edition of the The Horticulturist. [Volume 12 No. 4, Autumn 2003], shortly before he was taken ill.
David Robinson decided on a horticultural career aged ten. His top ten plants reflect the changing emphasis in horticulture in the second half of the 20th century; taking him from crop production to the aesthetic and functional use of plants and into horticultural tourism. I was unaware of the extent to which plants have changed my life until I began to write this article. Nor was I fully conscious, until forced to think retrospectively, of the rich and varied experiences that a career in horticulture can provide. I was especially fortunate in having the opportunity to travel to over 70 countries on horticultural business for every place is different and had something to teach. I was also surprised to see how the 10 plants selected reflect the changing emphasis in horticulture in the second half of the 20th century. I was around ten years old when I decided on horticulture as a career. My father was a small-scale builder and, as times were hard during the 1930s, he augmented his income by selling bedding plants in the Belfast market. My earliest horticultural memory is, as a youngster, removing groundsel seedlings from beds of ornamental Bellis perennis. I remember marvelling at how quickly this weed could produce flowers and its efficient method of seed dispersal. In my mid teens, I spent summer holidays on a vegetable farm near Comber, Co. Down weeding parsley destined for Glasgow . For weeks I crawled along drills with hessian sacks around my knees carefully removing groundsel, redshank, fat hen and other annuals from parsley seedlings. These experiences gave me an early insight into the key role that weeds play in nearly all aspects of horticulture and the drudgery involved in manual control. It also gave me a hatred of weeds, which still persists. When I took up my position at the recently established Loughgall Horticultural Centre in 1953, I was asked to carry out applied research on soft fruits. I evaluated cultivars, conducted nutritional trials but the main thrust of my work was on weed control. I would like to think that this was an objective decision based on the main need of the industry but I have a feeling that my early tussles with groundsel and other weeds also played a part. After graduation, my first job was as Horticultural Adviser in South Down. In 1953 I had an agricultural colleague who had recently been rejected by his girlfriend but was striving for reconciliation. 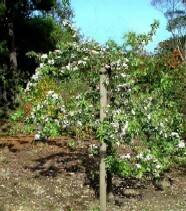 When his ex girlfriend’s mother asked him for advice on her non-fruiting apple tree, he turned to me for help. Clinging to the belief that solving the mother’s apple problem would help his case with the daughter, we paid them a visit. It was a fruitful advisory meeting although not as planned as I failed to impress the mother. However I made a much better impression on the daughter and two years later we married. During the 1950s, aided by a steady stream of new herbicides, our work in Northern Ireland made rapid progress and the weed problem in strawberries and other crops greatly diminished. In February 1959, I accepted an invitation from John Daly, Horticultural Instructor in Co. Wexford, Republic of Ireland to give a lecture on weed control in strawberries. At that time there was little contact at official level between Northern Ireland and the Republic and on my first expedition to the far south of the country, I had no idea what to expect. I was impressed with the enthusiasm of the over 300 growers who attended the lecture and I could see that growing conditions in the south east of the island were better than they were further north. Invitations to lecture on strawberries in other parts of the Republic followed, so my work with this crop gave me experience of parts of Ireland that I would not otherwise have had. When I was offered a position at Kinsealy Research Centre, Dublin in October 1963, the decision to leave Northern Ireland was the most difficult I have ever made. My current work was going well, I had a great bunch of colleagues, I had just obtained a Fulbright Grant to spend a sabbatical in California and the Republic then was a very different country from what it is today. Nevertheless the new job was challenging and I eventually took up a position in Dublin in May 1964. Undoubtedly I would not have made this major change if the strawberry had not given me many good contacts and friends in my newly adopted country. There was, of course, no truth in the story circulated by my facetious former colleagues at Loughgall that I was obliged to move on to fresh fields as I had contaminated so much land in the north with herbicides. The year 1958 was memorable as two remarkable herbicides, simazine and paraquat, with complementary properties became available for trial purposes. By using simazine to control germinating weeds and paraquat to suppress any survivors, it became possible for the first time to grow fruit crops virtually weed-free without cultivation. My colleagues and I conducted many trials, which showed clearly that higher yields could be obtained when cultivation, such as hoeing or rotavating, was eliminated. When not disturbed, the soil surface formed a crust, which often became covered with moss and looked the antithesis of a well-structured soil. But we could not ignore the evidence that plants were growing and yielding better despite the grim forebodings of many soil scientists at the time. We noticed that blackcurrant bushes that had been left non-cultivated all season made vigorous root growth right at the soil surface. Subsequent careful excavations in this crop and others showed that in weed-free plantations where the soil was not disturbed, most genera rooted extensively right at the soil surface. As this part of the soil profile is the richest in nutrients and oxygen and as surface roots are the major source of essential hormones such as gibberellins and cytokinins, this helped to account for the better yields consistently recorded on non-cultivated plots. It soon became evident that many woody plants had a degree of physiological tolerance of simazine and so from 1961 I used low rates successfully in the shrub borders around my home. The outstanding results revolutionised my attitude to the cultivation of ornamental plants. I saw that hassle-free gardening on a large scale was now possible and that woody plants were amenable to chemical weed control and grew better with their roots close to the soil surface. One of the hazards of using herbicides in ornamental plantings is that gardening becomes so easy that many people want to garden on a larger scale. Using the same rotation of herbicides that were now being used in blackcurrant plantations, I quickly outgrew two conventional sized gardens. My wife and I searched for a larger garden until 1969 when a house came on the market with five acres of south facing land tumbling down to high water mark. The labour intensive garden had been carefully manicured by two full-time gardeners and it seemed inevitable that the selling price of the property would be well beyond our means. Fortunately, those were the swinging sixties before gardening had become popular in Ireland and the immaculate garden and potential cost of future maintenance frightened off would-be purchasers. Consequently the house, despite its superb coastal location, failed to reach its reserve at auction. I knew that with herbicides as allies a shrub garden could be easily managed without outside help, basically in the same way as a blackcurrant plantation, and so we were able to buy the property at a low price. During the mid 1970s, my colleagues in Protected Crops Department followed closely Dr Allen Cooper’s pioneering work on Nutrient Film Technique (NFT) for tomatoes at the Glasshouse Crops Research Station, Littlehampton. In December 1977 I was invited by the Agricultural Research Council (ARC), Libya to give a lecture in Tripoli on ‘Modern developments in protected cropping’. This was not my area of expertise but none of my colleagues was enthusiastic about going to Libya just before Christmas. It was finally agreed that my colleagues would prepare a paper on Kinsealy experience with NFT, which I would present. It was only when I arrived in Libya that I learned that Dr Cooper had also been invited. I still remember my embarrassment when I saw that I was listed as the keynote speaker with Dr Cooper playing a subsidiary role. A hurried discussion with the organisers resulted in the printing of a new programme with Dr Cooper giving the opening paper on how he developed NFT while I followed with an account of Irish experience with this new technique. Although I had been initially doubtful about how much useful advice I would be able to give in Libya because of different climatic and economic conditions, I was agreeably surprised to discover on this, my first visit to a developing country, that a grounding in the principles of temperate crop production can help greatly in solving problems elsewhere in the world. The Agricultural Research Institute in Ireland had recently set up an Overseas Consultancy Service as a means of earning money to support home research. As Allen and I drafted a report for Libya ’s ARC, I realised for the first time that my colleagues and I could play a useful role in this new service. During the period 1977 – 87, Kinsealy staff worked in 23 developing countries while I visited Lesotho , Sudan , Saudi Arabia , Namibia and Malta on missions funded by FAO, Department of Foreign Affairs and other organisations. When Mike Nelhams, Curator of the Abbey Gardens , Tresco, visited me in 1993 he said, rather flatteringly I thought, that our garden was more like Tresco than any other in these islands. He made valuable suggestions about additional tender species that I should grow and offered me young plants of his favourite Agave (Agave ferox), the most architectural of the genus with its regular form and large teeth. I arrived on Tresco on September 20, 1994 and as we were admiring a fine specimen of A. ferox, a cruise ship arrived with a party of enthusiastic garden lovers. My visit was temporarily interrupted as Mike welcomed his guests and skilfully answered their questions. He also involved me in the discussion and I remember enjoying a three way discourse between the visitors, Mike and me in warm September sunshine. Afterwards the group leader informed me that holiday firms were looking for horticulturists to lead tours and so my new career as a gardening host was launched. Since then I have been involved in tours to many countries including the Caribbean, Polynesia, Madeira, Canary Islands and this year was privileged to lead groups to Borneo, New Zealand, Majorca and to lecture on a cruise ship in the Mediterranean. We set up a Nursery Stocks Department at Kinsealy under the leadership of Dr Keith Lamb in 1965. This work was very successful and among early results were marked differences in ease of rooting between varieties of Exbury azalea. This work was of interest to both professionals and amateurs and, although most of our open days were directed at nurserymen, we also held special events for the general public. During the 1970s, the Council of the International Society for Horticultural Science (ISHS) recognized that there was a need for better communications between scientists engaged in production research and people who utilize plants particularly in urban situations. Accordingly at the Horticultural Congress, Hamburg 1982, the ISHS established a Commission for Urban Horticulture, concerned with the functional use of plants to maintain and improve the urban environment. No member of Council was keen to become Chairman of this Commission and I was invited, and agreed reluctantly, to accept the position. In 1992, the German Horticultural Society selected Urban Horticulture as the theme for its Conference. This was the first time that members of the previous East and West German Horticultural Societies met together since reunification. As first chairman of the ISHS Commission, I was invited to give the opening address on ‘Urban horticulture – purpose and prospects’. This request worried me as I was not a specialist in that area but with invaluable help from former colleagues at Kinsealy I put together a paper and presented it to a large gathering of newly united German horticulturists in Berlin . Shortly afterwards I received an invitation from the Humboldt University, Berlin to accept a position of Guest Professor in Urban Horticulture and to give a course of 64 lectures on this topic in 1993. I refused adamantly, pointing out that Urban Horticulture was not my subject but under pressure I agreed to think about it. Believing that the best way to learn a subject is to teach it, I eventually agreed and so spent from three to six weeks in Berlin each year from 1993 to 1998 developing a course on Urban Horticulture. I enjoyed exploring this new area and working with enthusiastic German students – an opportunity that would never have occurred if I had not been impressed by the connection between research on ornamentals and the public who benefit from this work. From my early days I have been interested in the genus Eucalyptus. Between 1969 and 1998 I planted 120 species in my garden and was thrilled when the very tender Eucalyptus ficifolia (Red flowering gum) blossomed in 1976. Although probably biased, it seemed to me to be the most beautiful tree I had ever seen with its bright red flowers and attractive Ficus like leaves. I described this tree in a note in The Garden but by the time this was published the tree had been killed by the harsh 1976/77 winter. The memory of the transient beauty of that eucalypt haunted me but I was unable to take any positive action until 1995 when I wrote to the Professor of Horticulture, University of Western Australia , Perth and told him that I would like to produce a more hardy variant either by hybridisation or by selection. I received a warm invitation to his Department as a visiting scientist and spent six fascinating weeks there in January/February 1996 learning about eucalypt hybridisation and collecting seed under licence from native stock. Tree breeding is long term work and is still ongoing, both with progeny from a E. pulverulenta x caesia cross and with seedlings of E. ficifolia collected from native stands and from colder areas at higher elevations. An early disappointment was the realisation that the hardy E. gunnii was incompatible with E. ficifolia as they belong to different subgenera. One positive discovery so far was the relative hardiness of the attractive reddish/pink flowered E. leucoxylon ‘Rosea’ which survived unscathed - 7° C in the severe 2000/01 winter while hundreds of saplings of E. ficifolia nearby were cut down to ground level or killed. As I was leaving RHS Rosemoor in September 1995, Curator Chris Bailes thrust a tiny palm tree into my hand with the words:- ‘Take this Juania australis, it won’t survive with you. It doesn’t even grow at Tresco but try it’. After arriving home I planted the young palm but could find little about it, except that it is native of the Juan Fernandez (Robinson Crusoe) islands located off the coast of Chile at 34° S latitude. The 1995/96 winter was severe with an unusually low temperature of - 7.5° C but had no effect on the unprotected Juania. 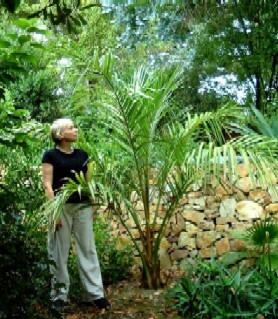 Since then it has grown well being easily the most vigorous palm in the garden and is now about 3 metres high. 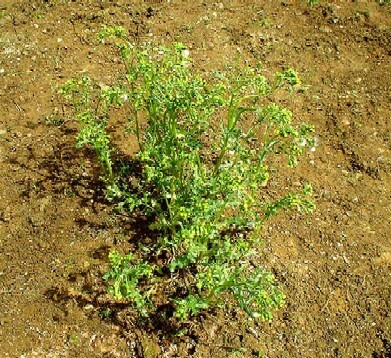 The base of this plant is kept free from weeds but otherwise it receives no attention, such as watering or feeding. I assumed that this was just another tender plant that liked my microclimate and non-tillage methods. It was only after I mentioned Juania australis on my web site (www.earlscliffe.com) and the letters began to arrive that I became aware that there was something unusual about this plant flourishing at 53° N latitude. This plant is, apparently, difficult to grow outside Juan Fernandez islands , as it dislikes both heat and cold, and has been described as ‘ungrowable’ in the European Palm Society’s Journal (Morici, C. (2000), Chamaerops 40)). I have written requested articles about it for Chamaerops and for the publication Manureva, Associ¾e de’l International Palm Society, have been taken on a memorable tour of palms along the Cote d’Azur (no Juania though) and have made many friends in recent years through this enigmatic plant. From 1969 we gradually developed a low maintenance garden, cutting corners where possible, leaving all plants unprotected in winter, forgoing the use of fertilisers, insecticides and fungicides and not making a fetish of tidiness as ours is an informal Robinsonian garden. Benefiting from the coastal location, virtually weed free environment and absence of root disturbance, many unexpected plants flourish, such as Cyathea dealbata, Cordyline baueri, Dacrydium cupressinum, Banksia spinulosa and Protea spp. Undoubtedly the most conspicuous plant is Echium pininana from the Canary Islands , which has naturalised itself in the garden and subsequently throughout the neighbourhood and across the Howth peninsula. The flowering spike of this rampageous exotic grows 5 cm/day between April and June and can reach a height of over 6 metres. Fortunately it will not become a troublesome exotic like Rhododendron ponticum as it competes poorly with existing vegetation. I enjoy the heated discussion that this plant evokes. Although many people are enchanted by its beauty and speed of growth, some are fearful of its triffid- like qualities and I have been berated for introducing a monster into the locality. Although very much at home here, it is almost extinct in its native La Palma . A Doctorate student from Reading University is currently studying the DNA and other properties of E. pininana here and elsewhere with a view to using seed from an appropriate source to help repopulate La Palma . I had no intention of opening the garden to the public but was astonished to received a letter from Ebury Press in 1996 asking if a description of it could be included in ‘The Good Gardens Guide, 1997’ with two stars, the highest accolade. The proposed description of the garden made special reference to ‘a forest of Echium ’. The garden at Earlscliffe is now open to groups by appointment and our lives and the garden are being continually enriched each year by contact with horticulturists, other scientists and student groups from many countries. With my background in research, I am especially pleased that the garden is being used to contribute to horticultural knowledge in small but diverse ways. For example, I send foliage of New Zealand plants to France periodically so that a New Zealand entomologist can test its palatability to potential pests, such as the Asian Gypsy Moth and Fall Web Worm. Because there are so few specimens of Juania australis in cultivation, leaf samples from my flourishing plant are being used In DNA tests by the Department of Systematic Botany, Aarhus University, Denmark in a project to help unravel the evolution of the Ceroxyloid and Phytelphantoid palms. And as absence of root damage is so important for the survival of marginally hardy plants, I continue to evaluate herbicides for use in ornamentals.